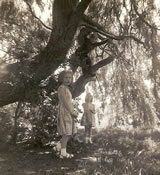 Wendy O’Reilly (Nee Harding) writes: I would like to share what I hope you find interesting reading, about the lives of three children - Glen, Melody and me, Wendy, who idolised their grandparents, Charles and Cissy Goddard who lived at 24 Ada Street, Saltaire. This was the sixties and our father, who grew up in Saltaire, took work wherever he could find it as a saxophonist and sometimes this meant abroad. 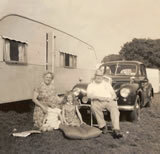 The one thing we three children looked forward to in those days was our trips to visit our Grandma and Granddad. Charles Goddard was not my father’s real father who sadly died when my father was about 9 years old. His real father was called William Harding who was the church organist in Saltaire and was also musically gifted which is where my father gift was inherited. My father was taught in Saltaire by Colin Holgate (I do hope the name is spelt correctly) who was a family friend and I remember him very well for always smiling and being lots of fun. Colin played with the big bands and was also very talented. 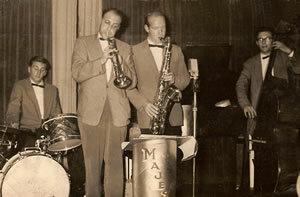 He taught the sax to top up his earnings in whatever spare time he had. My father has played all over the world and met many people throughout his career including the late great Larry Adler at the Piccadilly theatre. He joined the navy in 1943 – regiment No CJX408491 and was posted in Chatham docks. 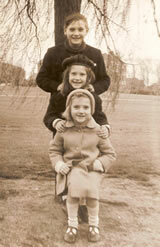 The three of us, my brother Glen (named after Glen Miller), my sister Melody and me, could not wait for the trips from London to see our grandparents in Saltaire each year. In the shed in the back yard would be all of our familiar things waiting, namely, our fishing rods where we would go and sit or play for hours down at the canal. I remember catching a stickleback, at least that’s what Granddad called it. Everyone decided the poor thing must have been blind to have been caught by a five year old, either that or the fish took pity on me! We decided after a few days to let the fish go back to the canal after spending a couple of days in one of Grandma’s kitchen pots in the back yard! These and so many other times are fondly remembered and shaped who we are today. I would so look forward to catching the little tram up to the Glen for picnics and gazing up at the huge statue of Sir Titus Salt who my Grandma worshipped and spoke of often, so much so that his name is still as important to me today. I found out that Sir Titus Salt apparently hated washing lines in people’s backyards and would cut them down if he ever saw them! He provided washing lines above the baths in the kitchens - I remember these in my Grandma’s house, the wooden worktop would lift up to reveal a bath underneath and the water from the washing line above would simply drip into the bath (ingenious!). I cannot remember what those wooden washing line constructions were called but they were very clever. Sometimes, I was allowed up to visit them on my own and my mother would put me on the coach back home armed with a bag of marshmallows which she told me were enormous tablets and I should take them when I felt a little travel sick (remarkably they would work!). My Granddad would be there at the other end in Shipley waiting for me and I can almost smell the baking of biscuits and cakes now as I remember walking nearer the house. 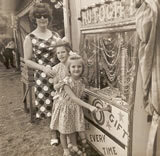 I think I remember the simple pleasures which were the best times, and that my Grandma and Granddad were so much fun. They adored each other and used to make us laugh so much. 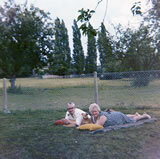 The one thing which my Grandma made me do with each visit was go and sit with Mrs Cox who lived a few doors along. She was very elderly and I realise now must have had some form of Alzheimer’s, but I would do as I was told and listen to repeated stories about Mrs Cox’s son. I think Grandma thought my visits to Mrs Cox would cheer her up, and I'm not sure if it worked but I like to think so. 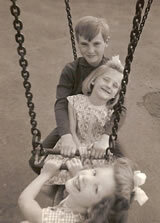 We were very lucky children to have had those days in Saltaire and hope you don’t mind me sharing my memories with you.